ATLANTA, Nov. 16, 2018 /PRNewswire/ -- The newest version of the popular Porsche Macan sport utility vehicle will make its North American premiere during the 2018 Los Angeles Auto Show. Prominent among the changes, the 2019 Porsche Macan features a new three-dimensional LED light panel at the rear, standard LED headlights, and a revamped interior design. Porsche Dynamic Light System Plus (PDLS Plus) is still available as an option, offering improved lighting while cornering. The taillights, which were separate on prior Macan models, now connect in similar fashion to other Porsche models, first seen on the 911 and now the Cayenne and Panamera. In addition to the revised exterior design, customers can now select a variety of new paint color options: Mamba Green Metallic, Dolomite Silver Metallic, Miami Blue, and Chalk. Starting with the 2019 model year, the Macan benefits from a larger, 10.9-inch full HD touch screen with the latest version of Porsche Communication Management (PCM). As in the Panamera and Cayenne models, users can customize the interface by positioning movable tiles and choosing their respective functions from a list of options. Fully connected as standard, the new system features online navigation, Porsche Connect Plus (with LTE phone module and SIM card reader), a WLAN hotspot, and an array of Porsche Connect services. Up-to-date online navigation data is available via a connection to HERE Cloud™ for route calculation. Apple® CarPlay® is optionally available. 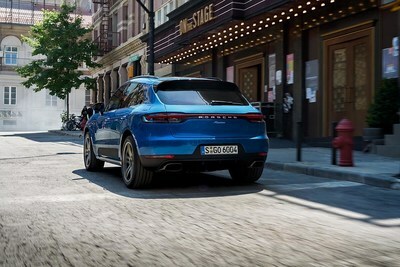 The 2019 Macan also gains the new Traffic Jam Assist function as a component of the optional adaptive cruise control system. When so equipped, the Macan can accelerate, brake, and keep itself within a marked lane at speeds up to 40 mph. The Porsche Connect app and Porsche Car Connect app enable the driver to communicate with the Macan via their smartphone. New for the 2019 Porsche Macan, the Offroad Precision app can be used to improve and even record off-road experiences in the Macan. The 2019 Macan comes with a 2.0-liter, four-cylinder turbocharged gasoline engine with 248 hp and 273 lb-ft of torque. In combination with its seven-gear PDK dual-clutch gearbox, the compact SUV can spring from 0 to 60 mph in 6.3 seconds, or 6.1 seconds with Launch Control if equipped with the optional Sport Chrono package, which migrates to an updated design for this model year. The new model can accelerate to a top track speed of 142 mph. The vehicle dynamics of the Macan remain its core feature. The updated chassis increases comfort and makes the Macan even more enjoyable to drive. As is typical for a sports car, the Macan comes with staggered sized tires, underscoring the benefits of rear-biased Porsche Traction Management (PTM) all-wheel drive. Newly developed tires with improved performance characteristics allow for improved lateral dynamics as compared to previous model years. The wheel diameters range from 18 inches as standard to optional 21-inch diameter, and include new designs. 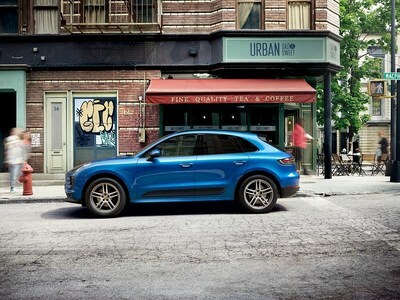 An expanded range of options and assistance systems is also available with the new Macan. The optional GT Sport steering wheel echoes that found in the Porsche 911. A mode switch integrated into the steering wheel – including the sport response button – is part of the optional Sport Chrono package. Porsche has extended the list of options designed to enhance convenience, which now includes a heated windshield and an air ionizer that – together with the standard fine particulate air filter – improves the quality of the air inside the vehicle. The new Macan is expected at U.S. dealers by summer 2019. 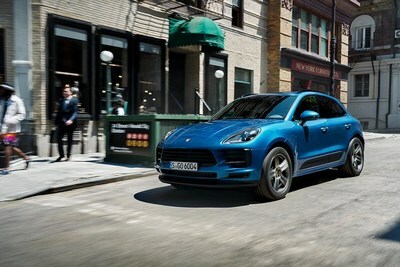 Built at the Porsche factory in Leipzig, Germany, the compact SUV is available in the United States with a starting MSRP of $49,900 excluding $1,050 for delivery, handling and processing. Established in 1984, Porsche Cars North America, Inc. (PCNA) is the exclusive U.S. importer of the Porsche 911, 718 Boxster and 718 Cayman; Macan and Cayenne; and Panamera. Headquartered in Atlanta, Georgia since 1998, PCNA is also home to the first Porsche Experience Center in North America featuring a module-based 1.6-mile driver development track, business center, and fine-dining restaurant, 356. The company operates a second Porsche Experience Center near Los Angeles. That 53-acre complex features a driver development track with eight educational modules totaling 4.1 miles, a business center, and Restaurant 917. PCNA employs over 300 people who provide parts, service, marketing, and training for 190 dealers. They, in turn, work to provide Porsche customers with a best-in-class experience that is in keeping with the Porsche brand's 70-year history of leadership in the advancement of vehicle performance, safety, and efficiency. PCNA is an indirect wholly-owned subsidiary of Porsche AG, which is headquartered in Stuttgart, Germany.